Headphones have come a long way since they were first used by telephone operators in 1881. This revolutionary single-earpiece device weighed in at over four-and-a-half kilograms, and had to be rested on the operator’s shoulder during use. Nowadays, headphones are comfortable, portable, and advanced enough to even block out unwanted ambient sounds (traffic, crying babies, noisy colleagues etc.). 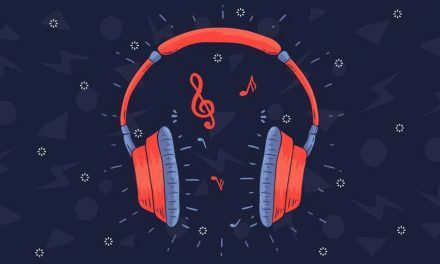 Noise cancelling technology allows you to really enjoy your music, and can vastly improve the clarity of any on-the-go work calls you have to make. However, choosing a pair of noise cancelling headphones can be a daunting task because we are spoilt for choice. There are many excellent products on offer, but which ones will suit your needs best? Active or passive noise cancellation? Bluetooth? On, or over-ear? It’s easy to feel lost from the get go. So, following on from our previous article on the topic, here are three more noise cancelling headphones for you to consider: AKG N60NC Wireless, Audio-Technica ATH-ANC9, and Plantronic BackBeat Pro 2. 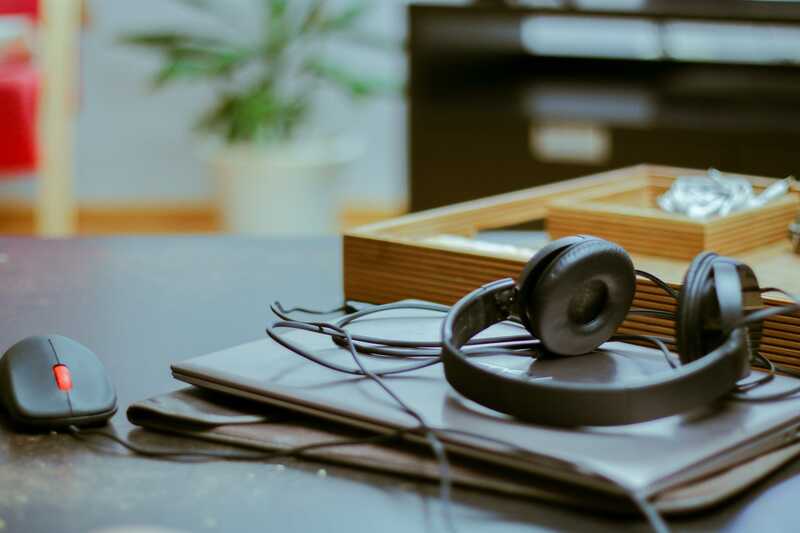 Oh, and while we’re at it, check this out: If you regularly (or are planning to) use noise cancelling headphones for making calls, you should definitely check out Krisp. 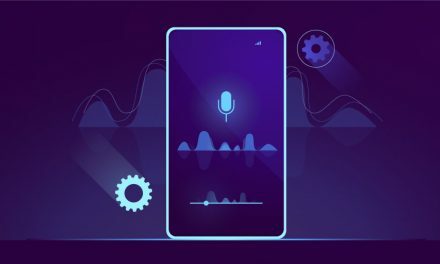 This nifty noise cancelling app filters out pesky background noise at both ends, boosting the quality of your calls significantly. Try it for yourself, and let us know how you get on in the comments section below! The AKG N60NC Wireless on-ear headphones are very easy to get the hang of right out of the box. However, there have been some reports of the side buttons on the right ear cup being a bit fiddly to use. Users have reported skipping tracks forwards when they wanted to go backwards and also turning the headphones off by accident due to the power button being a little too close to the skip buttons. AKG decided to make some design improvements to this new wireless version of the N60NC model. The earcups have been treated to slightly thicker padding, and the new headband doesn’t clamp down on your head as tightly, so they are much more comfortable to wear, especially when you need to make long calls. 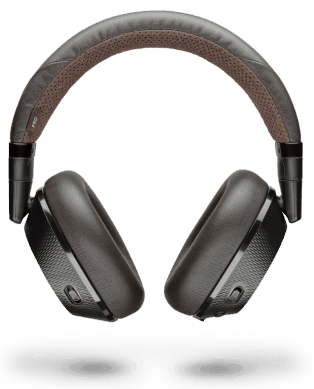 The battery life is rated to last up to 15 hours with both Bluetooth and noise canceling engaged – not so great, but they will last for up to 30 hours with noise cancelling enabled in wired mode. When it comes to choosing between on and over-ear model, everyone has their own preferences. AKG has done a very good job of making sure their on-ears are as comfortable as possible – weighing in at 98g. The noise cancelling ability of these headphones is pretty good, as should be expected for the price. However, the AKG N60NC Wireless headphones lose a mark for the lack of a sidetone function (a nifty feature that enables you to listen to your voice through the headphones as you talk). At this price point, it is fair to expect such a feature. That being said, the wired version of the AKG N60 NC worked well, and it’s the same deal here. These noise cancelling headphones work well in wireless mode, and they are able to provide you with a clean, balanced sound. As always, there is a slight drop off in quality when you switch to wireless mode but you always have the option of using the provided cable when you need to. Good, but it could be better. It’s nice to have the option of going wireless but there is a noticeable difference in terms of sound quality when you switch between the two “modes”. When the wire is attached, the sound is great – nice and rich across all frequency bands. A bit of this is lost when switching to Bluetooth, and as a result, the bass loses some of its punch and the treble doesn’t shine through as well. The ANC9s provide a comfortable fit, even for long stretches of time. Audio Technica uses memory foam in the cups and along the headband, which does heat up a little bit, but never enough to be uncomfortable. The cup covers are easily removed, in case you want to give them a wipe down or replace them. The Audio-Technica ATH-ANC9s are a great-sounding pair of noise cancelling headphones, but you’ll have to keep a packet of AAA batteries handy if you want to get the most out of them. This will gall some music lovers, especially when Audio-Technica is asking $115 for them. The sales package is rather generous, though, with a tough-shell case, an alternative hands-free cable with a microphone and a two-prong airplane adapter; but a rechargeable battery would definitely have been the icing on the cake. The ANC9s provide a comfortable fit, even for long stretches of time. Audio Technica uses memory foam in the earcups and on the headband, which creates a comfortable fit. The cup covers are easily removed, which makes it easy to clean and replace them. A negative with this model is that it doesn’t ship with a rechargeable battery. This means that to get the most out of the headphones, you will need to keep spare AAA batteries with you whenever you use them. 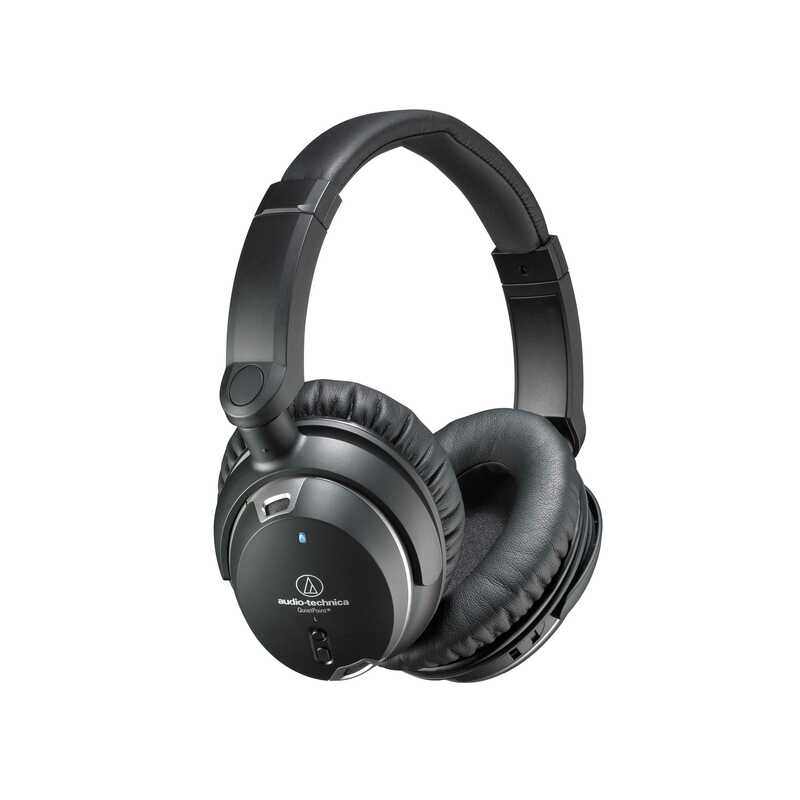 The Audio-Technica ATH-ANC9 headphones have three noise cancelling modes: Airplane, Office and Study. 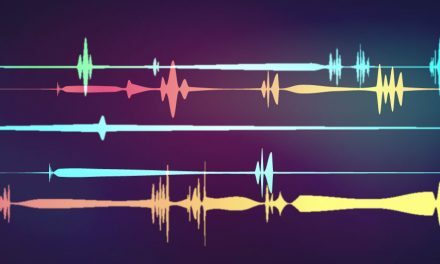 Audio-Technica explains the differences between them as: Airplane mode cuts 95% of environmental noise at 200Hz, Office 95% at 300Hz and Study 85% at 200Hz. Each mode works well, and it’s always nice to have some control over your gadgets. The noise cancelling process is handled by four microphones (two mics in each cup), which sample ambient noise and produce the cancelling effect. This works perfectly but those four mics are power-hungry. You will have to use replaceable AAA batteries with this model, but Audio-Technica does claim that the ATH-ANC9 will provide you with 30 hours of noise-cancellation. The Audio-Technica ANC9 sound great, and even better with noise cancelling switched on (with other headphones, the sound quality is known to suffer when the noise-canceling function is activated). To give you an idea of how: when switched on, it has a similar effect to a loudness boost on an MP3 player. The audio is well replicated across all frequencies. The highs are snappy, and the bass has nice rumble. It’s the mids that really impress here though. The ANC9 is great at making sure you get to hear your favourite tracks in proper detail. A bonus here is that if your batteries run out, these headphones will work in a passive capacity. This does affect the sound quality slightly (passive mode certainly favours the bass with these cans), but the sound is still good, nonetheless. The Plantronic BackBeat Pro 2 has been designed to make the cans as simple to use as possible. All of the buttons and connectors are in sensible places, and the battery life (you will get a full 24 hours at moderate volume levels) and Bluetooth connection strength is more than adequate. The cloth carry pouch is nice, and these headphones work excellently as a headset for making phone calls. An added bonus is the addition of the “side tone” feature. This allows you to listen to your own voice as you talk, should you wish to do so. They also included a cable, so you can use the BackBeat Pro 2 as wired headphone – if necessary. Plantronic has managed to slim the headphones down by about 35%, and reduce their weight by about 15% as well. I doing so, they have made their product look much sleeker, and the weight and size reduction has made them more comfortable to wear and use. The BackBeat Pro 2 also has sensors that enable you to pause and resume playing your music whenever you take your headphones off, or put them on. There are also another couple of handy features: one is that you can answer calls automatically by putting the cans over your ears, the other is the addition of a mute button on the right earcup, allowing you to mute your voice – something which can be useful when you’re on a conference call and don’t want other people on the line to be distracted by whatever is going on in background at your end. The company has really done a sterling job of updating the design of their product. 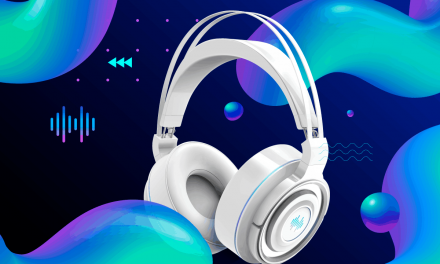 When comparing the noise cancelling technology in these headphones with the BackBeat Pro, it is notable how much Plantronic has improved things in its latest incarnation of the BackBeat Pro. The headphones deliver above and beyond what you find in similar priced noise cancelling headphones on the market. You will have no problem using these in a noisy office or packed commute. The sound quality delivered by the Plantronic BackBeat Pro 2 is definitely an improvement on the original BackBeat Pro. In fact, in terms of sound quality and overall headset performance goes, these cans are not too far behind the more expensive offerings from companies like Bose. 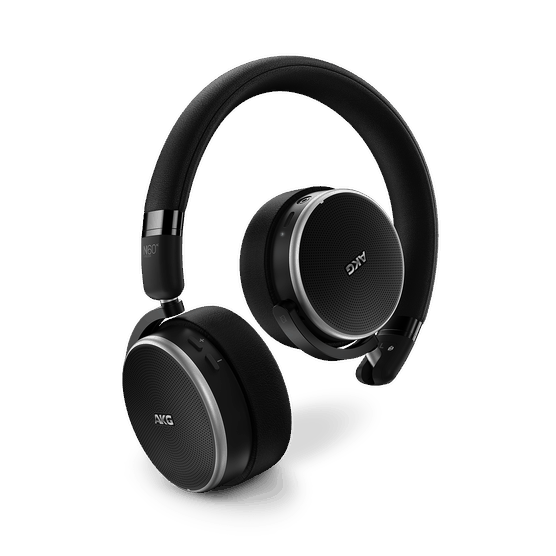 The Pro 2s also function perfectly as a Bluetooth headphone, and calls and music are clear because of the excellent noise cancelling technology within. Each of these noise cancelling headphones come with different pros, cons, features, and price points. After weighing up the pros and cons of each, the Plantronic BackBeat Pro 2 comes out on top. The amount of features, and quality of sound that you get for the price made this an easier decision than it might have been had the BackBeat Pro 2 been $50 more expensive. It’s also worth mentioning that Plantronic offers a special-edition model, it’s priced at about $50 more and comes with a hard carrying case and supports NFC, so you can easily pair the headphone with any “tap to pair” devices that you might have. If you are still struggling to make your mind up, don’t forget to check out our handy ultimate noise cancellation headphones guide. Good luck in choosing your new set of noise cancelling headphones! Let us know in the comments which ones you would pick and why? If you have any recommendations for others, don’t be shy!